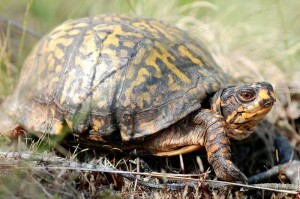 The Box Turtle Working Group was formed at the 2005 NEPARC meeting. Since then the group has compiled and developed educational materials that will help efforts to conserve the Eastern Box Turtle (Terrapene carolina carolina). Project examples include producing a postcard encouraging people to leave box turtles in the wild, developing an informational webpage to direct people to existing educational materials, and compiling a list of veterinarians and wildlife rehabilitators that work on turtles. The group has not been active since 2010, but will soon need to update documents and consider other products that may further the conservation of Eastern Box Turtles in the northeast United States. If you are interested in joining the Box Turtle Working Group, email Lori Erb.